It’s been months since Star Wars: The Force Awakens hit theaters, and we’re still reeling from the scope of that movie. J.J. Abrams successfully took the semi-defunct franchise and completely revitalized it on the big screen. That being said, some people have opted not to see the latest Star Wars offering in theaters. While that’s fine – ill advised, but fine – Abrams has one very important request for his audience: Please don’t watch The Force Awakens on your cell phone. Anyone who makes movies will say: 'Please don’t watch my movies on that.' It is the nightmare of every storyteller that people are going to watch something you made on something so small. Anyone who knows anything about the Star Wars franchise knows that it’s not a series designed for the tiniest of screens. It’s a large-scale franchise that revolves around enormous set pieces and bombastic action sequences. While one does not necessarily need to see a Star Wars film on the silver screen to appreciate it – many of us became acquainted with the series on old VHS tapes – it’s not an experience designed for an iPhone and a pair of ear buds. It’s a sentiment that has become fairly commonplace among members of the filmmaking community. The Dark Knight director Christopher Nolan also recently issued a grim warning about a potentially tragic fate for movie theaters in general. As ticket prices go up, audiences turn to mediums that films may not necessarily have been designed for, and in the end that will lead to a diminished experience for the consumer. 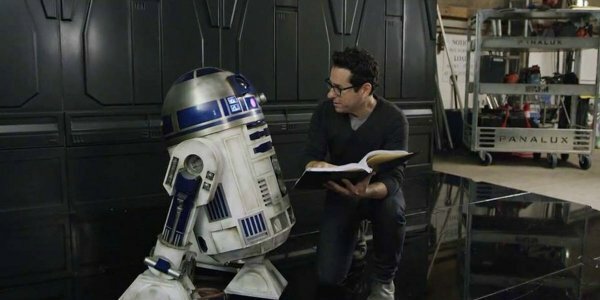 However, J.J. Abrams went on to admit that he does think that there’s a place for cell phones in the world of filmmaking. One of the beauties of recent advancements in mobile devices is the fact that anyone can actually produce a film of their very own. Granted, the quality won’t rival the top Hollywood cameras, but any one of us has the opportunity to use our iPhones and craft a short film – at the very least introducing ourselves to the art of filmmaking. What are your thoughts on this issue? Do you think certain films need to be watched in their intended format, or is it fine to watch them on a cell phone with a set of headphones? Let us know what you think in the comments below to keep the conversation going. If you fancy yourself the cell phone type, Star Wars: The Force Awakens will be made available on iTunes on April 1. Stay tuned for more details. J.J. Abrams also took a hard stance on the controversial concept of The Screening Room, a program that would allow patrons to pay up to $50 to watch theatrical features in their homes. He and several other filmmakers, from Steven Spielberg to James Cameron, had a lot to say. Do they support this program? Read their comments on Page 2. The Screening Room would deliver theatrical releases directly to your television on the same day they hit the theater. The catch is that such a thing would cost you $50 per film, on top of a $150 special set-top box. Sean Parker and Prem Akkaraju have attempted to get theater’s support for this plan by offering to share the revenue with them. It didn’t work. However, several top filmmakers weighed in on the topic, and their opinions have been collected here. That's not all. During the SXSW festival, J.J. Abrams explained why he probably won't return to direct any more Star Wars films. And we learned a pretty funny story about how a cat helped perfect a sound effect used during a crucial scene in Star Wars: The Force Awakens.